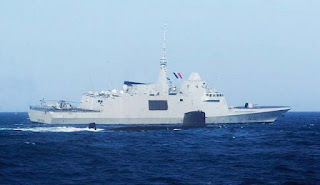 KUALA LUMPUR, -- The French Navy (Marine Nationale) latest Aquitaine class FREMM Frigate Provence conducted an anti-submarine warfare (ASW) exercise with the Royal Malaysian Navy. Provence and the Scorpene class submarine Tun Razak conducted the exercise off the Northern coast of Borneo island in the South China Sea. The submarine and the frigate (both built by DCNS) and the frigate's NH90 NFH helicopter a Cayman 33F flotilla faced each other in several ASW scenarios. This was the first time French and Malaysian units performed this kind of exercise in the South China Sea. Designed and built by DCNS the Multi-Mission Frigates (FREMM) are a centerpiece of the modernization of the French Navy. They are a game changer in particular with their high technology, versatility and flexibility. 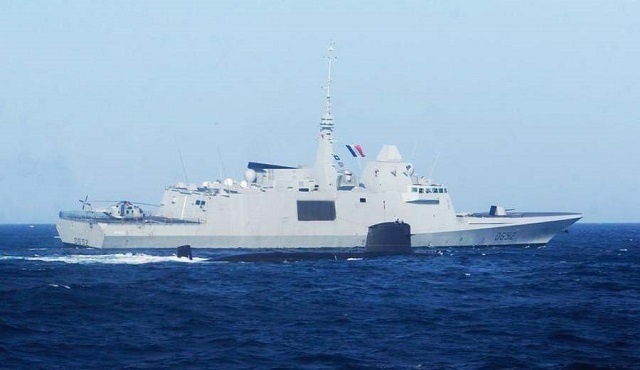 The French Navy FREMM Provence sailing alongside Royal Malaysian Navy Scorpene class submarine Tun Razak.